ITworld got an exclusive first look at Windows Server 8. Here's the cream of the crop of the 300+ new features. On September 8th, shortly before the public unveiling of Windows 8 client, I headed over to Redmond for a two-day meeting where Microsoft talked about what's in store for Windows Server 8. According to Microsoft's Bill Laing, Corporate Vice President for the Server and Cloud Division, the server team implemented over 300 new features, all of which "target businesses that are moving to the cloud and manage servers and devices, whether they're physical or virtual, on-premise or off-premise." Let's be clear about one thing: Windows Server 8 is a major release. 300+ features and a big architectural change seems mind-blowing (and also scary) for CTOs and admins in charge of managing hundreds of servers. We're dealing with heavily modified fundamentals here. Existing server technologies, roles and features have been expanded; with a big emphasis on cloud, servicing and simplified automation/management. Oh and by the way, Microsoft moved the obviously cloud-focused Azure team into the same organization, which should speak for itself. So where are we on the roadmap? Microsoft explained to us that the planning for Windows Server 8 began 16 months ago and (as of Mid-September) they're nearing the end of the development phase, which isn't quite as finished as I originally thought. Although they didn't talk specifics, I expect a beta of both the server and client at the end of the year and a release candidate in early 2012, with a release to manufacturing sometime in April or May. Again, Microsoft is at the end of the development and feedback stage, in which they performed 6000+ customer requirements and more than 26,000 customer surveys to find out and evaluate what businesses want. Bill Laing made it clear that they've tried hard to listen to customers this time and not overpromise and underdeliver (hello, Vista). So what’s in store? Let's dig in to the absolute highlights of the reviewers workshops. One of the most obvious changes of Windows Server 8 is the brand-new dashboard: Microsoft wants to do away with the typical Server welcome screen and old-style MMC management. Though I was told this is nowhere near final, the new "Windows 8 Server Dashboard" features a Metro-style user interface and Windows Phone 7-like tiles. The goal: give admins at-a-glance alerts on their server roles and manage local, virtual and connected servers via one single interface. It shows all current roles of the server in one window and allows admins to instantly check for problems and alerts. These bullets will get highlights in the case of an event. Once the Fax Server encounters errors or other events (a problem with the print spooler service for example), you're going to see a red warning sign next to "Services". By clicking on it, you'll get both an overview of the alerts and several troubleshooting options. Event filtering helps you blend out events that you don't want to see, such as basic or recurring "Information" events or events that don't concern the operation of your server. 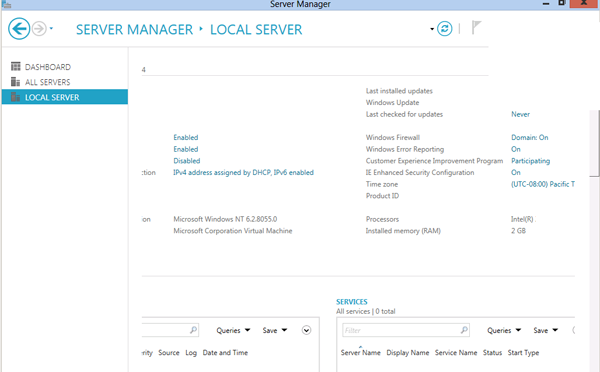 By eleminating all of that clutter, the new dashboard also allows you to manage multiple servers at the same time, by aggregating information from all connected Windows Server 8 machines into the new Metro-style interface. While the initial screen looks nice and tidy, when you go deeper into the UI you'll find dialogs and windows that remind you of Windows NT's early days. Plus, I heard rumblings that Microsoft might revamp this entire thing, which would be odd since we're at the very end of the development cycle. Again, this is the current state of things and I’m not sure how much of this is being changed. In Windows Server 8, literally everything seems to be manageable using PowerShell scripting. Most features shown to us at the reviewers workshop were built to be managed by PowerShell first and UI second. For example, data duplication still has only a very basic UI, while about 80% of its true potential can only be managed using the little blue PowerShell.